Many of the goals in this book have been selected based on a comprehensive review of state standards for instruction in the elementary school grades. 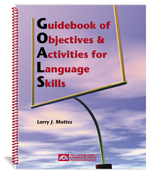 This practical resource is a must for speech-language pathologists and special education classroom teachers. Reproducible record forms are included. This book is also available in a downloadable format (Product #4222DL).